Browse our world textiles,dhurries,baskets,cushions, duvet covers and rugs. 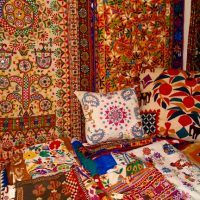 Enjoy browsing through our shop with Antique, Vintage and Contemporary World Textiles, Rugs and Cushions, sourced by our team from around the globe. We pride ourselves on our personal relationship with our suppliers, regularly checking both the quality of our products and the work places in which they are produced, ensuring that the workers receive fair pay and work in a clean, pleasant environment.